ACE MV executive director Sam Hart talks about study results at a meeting Tuesday. When it comes to adult education on Martha’s Vineyard, there is a wide difference between what Islanders want and what employers and community leaders believe is needed. A recent study commissioned by Adult and Community Education of Martha’s Vineyard (ACE MV) tells the story. The two-part study began with in-depth interviews of 47 community stakeholders representing a wide variety of professions and Island businesses. All community leaders identified a need for technical and job skills courses, including computer competence, clerical skills, food safety and commercial driving. Yet in the second phase of the study, an extensive survey questionnaire, only 28.1 per cent of the 559 people who responded identified a need for technical and job skills courses. The largest group of respondents, 58.7 per cent, wanted personal enrichment courses such as do-it-yourself home projects, writing, language and art classes. 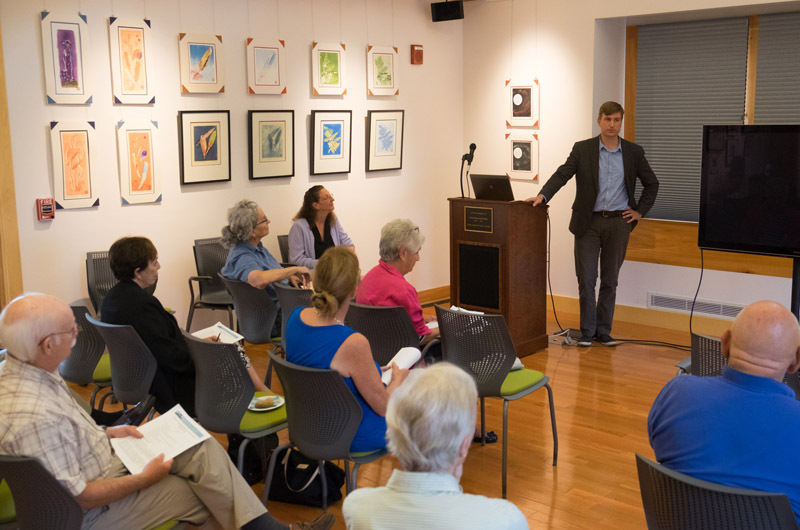 Presenting the results to the public this week, ACE MV executive director Sam Hart said much of the disparity can be explained by the age of those who participated in the survey. More older Island residents responded than younger age groups. In other categories, the two phases of the study are more closely aligned. A total of 40.6 per cent of survey respondents cited professional development and certifications required by state regulators as important. Business and community leaders who cited the need for continuing education in those areas totaled 55.5 per cent. Survey respondents who wanted college and graduate level credit courses totaled 34.9 per cent, while 66.6 per cent of the community stakeholders cited the need for college credit courses in interviews. Offering continuing education to disparate groups will be challenging, but Mr. Hart said the study demonstrates a clear need and a strong demand for technical education and certification prep courses. Mr. Hart said ACE MV has already changed its course offerings based on the preliminary results of the study. As an example, he cited a preparation course for a hoisting license, which filled up quickly. The license is required for anyone operating a backhoe, excavator, bucket truck or other heavy equipment. Fines for operating without a license can be stiff, up to $3,000. Operators face jail time in the case of an accident by an unlicensed operator that results in injuries. ACE MV will now offer the class and provide transportation to the testing site. Similar demand is evident in other professional development and college courses. Mr. Hart said 42 local teachers are already signed up for a two-year masters in education program taught in conjunction with Fitchburg State University. Courses for certification in green building practices, required for contractors building under the state’s new energy efficient building codes, filled up by word of mouth, even before the course catalogue was printed and distributed, according to Mr. Hart. The study also identified barriers to continuing education. Some (42.6 per cent) said the cost of the courses was a barrier, while others (42.4 per cent) said they don’t have time to take courses because they are working too many hours. A lack of resources, including computers, and online access, was cited by 22 per cent of the survey respondents. “For those who work here, for those who need [employees] to work here, and those who want to live local, there are too few opportunities for personal and professional growth,” Mr. Hart said. The study was funded by the Permanent Endowment of Martha’s Vineyard, the Cape Cod Five Cents Savings Bank Charitable Foundation Trust and the Farm Neck Foundation. The largest part of ACE MV funding, about $100,000 comes from fees and tuition for the courses offered. Island towns support the program through town meeting appropriations totalling $70,000, based on a formula that takes into account population and property values. The rest of the $290,000 budget comes from grants and private donations. Fall courses begin in October; a course sampling night is scheduled for Thursday this week.